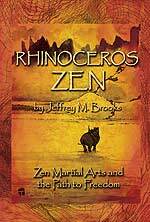 Editor’s Note: This article is an excerpt (Chapter 20) from Jeffery Brooks’ new book, “The Rhinoceros Tale – A Practitioner’s Guide to the Alchemy of Action,” now available in FightingArts.com’s e-store. The book is a fresh perspective on karate and Zen which emphasizes the importance of dedication to practice. Included too are new insights and stories of Okinawan karate and Zen masters as well as stories - moving, terrifying, humorous -- about the people who have made practice their own. Accepting that self-defense training has a meaningful place in life lets ask the next question: what’s the best way to do it? Karate training properly done involves mostly subtraction. One of Japan’s archetypal figures is samurai, strategist and poet Miyamoto Musashi. He lived in the 16th Century, fought in many battles, killed many opponents, according to legend he trained in solitude for fifteen years and emerged as Japan’s greatest sword master. Late in his life he recorded his understanding in the still popular Book Of Five Rings. In this compendium of advice for martial artists Musashi says it takes a 1,000 days to forge the spirit and 10,000 to polish it. One of the implications is this: during the first phase of a life of practice, the first “1,000 days”, we are adding to our store of knowledge, strength and skills. In the first phase of karate training you learn new techniques, become acquainted with new tactics, adopt a new vocabulary and discover new capacities of your body and mind. For that period of time the emphasis is on the additive aspect of training. Sometimes people get stuck in this phase and assume that developing as a martial artist means continually accumulating strength, skill, knowledge. This kind of person can seem sincere and energetic. They will say they are “seeking.” Their karate life focuses on accumulating information -- about techniques, methods, styles, teaching lineages, terminology. They may study half a dozen styles or more, switching back and forth from one to the next over the course of days or years. After they have been dabbling for a while their attention will shift from practicing their style. They will devote the time they would have used for practice to reflecting on comparative taxonomy, analyzing similarities and differences between styles, in ways of moving, on detecting and speculating on the meaning of the variations of postures in different traditions, in tactical approach, in the means of energy transmission, target maps, feeling obliged not only study Chinese medicine and five elements theory, but try to apply them to the methods of fifty teachers. This is a trap that many of us can fall in to. It is interesting. It looks very appealing. But where does this emphasis on accumulation get us? We may miss the chance to master a martial art because our time is limited and mastery comes from practice. Not “knowing about” it, but doing it. And changing as a result. You cannot practice effectively without learning the fundamentals. And new insights will often arise directly from your own experience in action. But you will not experience the polishing of the body and the emotions, and the deeper transformation that comes as a result of real practice, if you concentrate too long on accumulation. Musashi points this out. The second phase in Musashi’s description, the 10,000 days, is the polishing. Polishing is a negative process. It requires a lot of energy. If you have ever polished some hard, tough material like metal or marble you know how much energy it takes. And it takes faith in the efficacy of that effort, since the results come slowly and, at first, imperceptibly. Polishing is removing the stuff that obscures the real nature of the material. Now it is possible to object to the polishing analogy: in polishing a stone the work is purely of negation, and the effects remain on the surface. In polishing a human spirit, in the second, 10,000-day phase, there is also a transformation underway. That is in “polishing the spirit” we are changing the quality of our body and mind rather than just removing what is obscuring its nature. When we practice we use our intention and our effort and our thinking to repeatedly put the body and mind under precisely calibrated pressure. Through this intelligent conspiracy our muscles, tendons, organs and bones change in substance -- becoming tougher and more resilient and more our own. We experience our minds changing in character as well -- an almost alchemical transformation from dull to quick, from scattered to focused, from volatile to stable. You can easily see that when an untrained person undergoes high pressure (in a self defense situation or a personal crisis for example) they tend to lose their composure. When an untrained person undergoes very low pressure (a long period of meditation or a long wait in an airline terminal, or an unstructured vacation) their mind tends to behave like a bunch of bats -- scattered, unruly, subject to inner impulse and outer sense stimulation. As you practice that changes. You feel the quality of your own mind shift, becoming more stable, less contingent on conditions, not so easily disturbed by inward fluctuations or outer sensations, not dependent on fixed ideas in order to hold steady. Having practiced for a while we sense that our mind and body have undergone a transformation in substance. It does not feel, subjectively, like some interfering, adventitious stuff has been removed. But we have to look at this process more deeply, because we can perceive our true nature if we do. This phrase “true nature” can sound like it means “what we are really like inside.” That is not what I mean by it. I mean not “what we are” – not our physical substance or psychological mechanics, as if to imply that these things have a fixed character of their own. Rather I mean it metaphysically: that in fact we exist as beings utterly susceptible to transformation through the alchemy of our own action. Jeffrey M. Brooks holds a Go Dan Fifth Degree Black Belt in Matsubayashi Shorin Ryu, training in Okinawa, Japan and the USA with Shoshin Nagamine, the founder of the style, Takayoshi Nagamine, his successor, as well as numerous others in the Matsubayashi Ryu lineage and related Chinese traditions. His Buddhist study and practice is with Rev. Issho Fujita, resident director of Valley Zendo and Geshe Michael Roach of the Asian Classics Institute. He has an M.F.A. from NYU Film School and works as a speechwriter for public figures. He is founder and director of Northampton Karate and Northampton Zendo in Northampton, Massachusetts, offering classes daily for adults and children since 1988. (www.northamptonkarate.com). Brooks’ column, “Zen Mirror”, and other articles regularly appear on FightingArts.com.